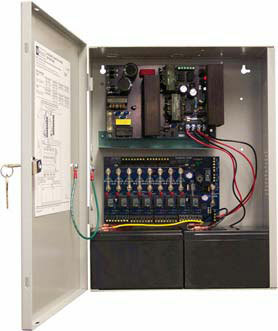 Route power to a variety of access control hardware devices. Model AL1024ULACM converts a 115 VAC 60Hz input into eight (8) independently controlled 24VDC non power limited fuse protected Fail-Safe and/or Fail-Secure outputs with a total of 10 amp continuous supply current. The fire alarm disconnect feature enables emergency egress in the event the fire alarm system is activated. It is individually selectable for any or all of the eight (8) outputs. All products Barcode Discount sells are new (not used). Most products ship via our low cost flat rate shipping the same day your order is placed and can ship overnight to anywhere in the US. Our prices are amongst the best available anywhere. Buy online or call 1-800-485-3730 for a free review of your product needs by one of our knowledgeable product experts.